Yarn Pooling or color pooling is a way to take your variegated yarn and create beautiful crochet projects with unique pattern. You need to start with a Multicolored yarn such as Red Heart Super Saver Stripes yarn . A crochet hook that works with the yarn 4mm/US G-6, 4.5mm/US 7, 5mm/US H-8, 5.5mm/US I-9 are common sizes that work with worsted weight yarn. A darning needle and some scissors are also required. The yarn should be able to change colors after several inches, have consistent lengths of color, and have a consistent color repeat. If the yarn is too short, or changes colors too quickly the color pooling will not happen. Color pooling is done by crocheting the moss stitch. The stitch is the same for most patterns but the number of starting chains changes. What also makes a difference is your tension and hooks which all makes the magic happen. One way to crochet beautiful planned pooling projects is to use the new crochet book called Yarn Pooling Made Easy. 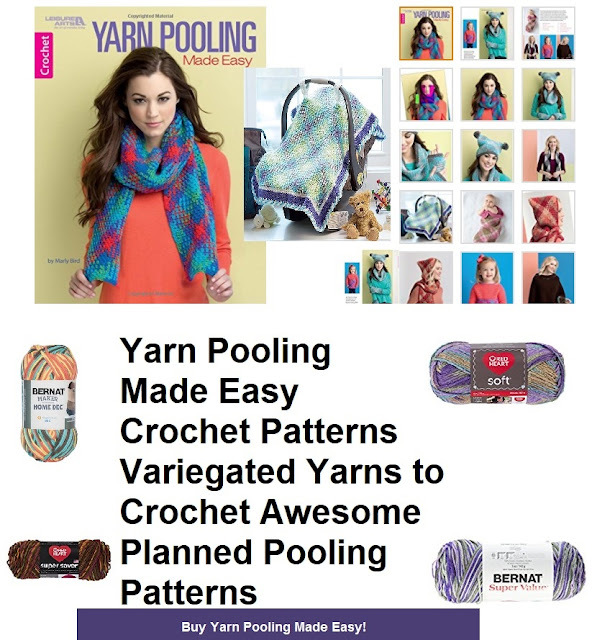 With Yarn Pooling Made Easy from Leisure Arts, anyone can learn about planned pooling and join the fun of using variegated yarns to crochet awesome planned color pooling patterns. The author of the crochet planned pooling book is a pioneer in discovering the secrets of this popular technique, Marly Bird shares her simple instructions and a variety of projects with eye-catching argyle patterns. Designs include Full Scarf; Cowl, Wristers, and Hat Set; Zig-Zag Scarf; Car Seat Cover; Baby Cocoon; Hooded Scarf; Child’s Sweater; and Poncho with Raglan Yoke. All are for Easy skill level using medium weight yarn.